Elizabeth Sutherland died at Morven House Lybster 11th June 1951 aged 69. Husband John Sutherland saddler 22nd December 1960 aged 84. 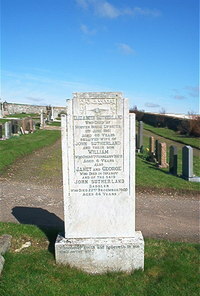 Son William Sutherland died 8th February 1929 aged 6. Janet and George died in infancy.